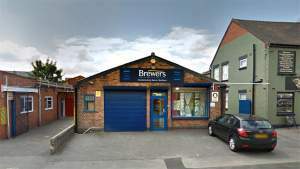 Our Nuneaton branch has a long history supplying painters, decorators and DIY enthusiasts in the area; before joining the Brewers family in 2008 the shop was known as Bacon Brothers. Now it offers a wider selection of paints and the widest variety of wallpaper pattern books in the Nuneaton area. The team is extremely friendly and positive, proud of making sure you get the best product for each job and enjoy the best results. We have more than 50 years’ industry experience between us and we can visit sites to assess and evaluate the most suitable products. This service is especially valued by customers taking advantage of our protective coatings expertise. You can park right outside to load up with fabrics, paints and decorating equipment. We’re easy to find: opposite Halfords and right next door to Cawthornes Copy Shop, on Corporation Street just off Powell Way from the Dandelion Roundabout. Travelling anti clockwise around the A444 take the first exit onto Powell Way, then turn immediately left onto Corporation Street. Travelling clockwise round the A444 take the third exit onto Powell Way then immediately left onto Corporation Street.